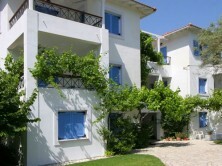 Armonia apartments in Vasiliki are newly constructed, fully furnished and offer high quality self contained accommodation. Each unit includes generous bedroom /s, fully furnished kitchen and meals area, separate bathroom and toilet and large outdoor private balcony. Ample on-site parking is provided in the shade of established olive trees.